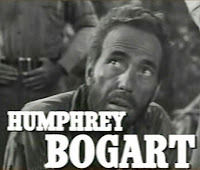 Unlike illicit lovers who conspired to murder a spouse to reap the rewards of a life insurance policy or a bank employee who aspired to sneak out the loot undetected, Dobbs (Humphrey Bogart) and Curtin (Tim Holt) had no intention of taking any illegal shortcuts prospecting for gold with their knowledgeable elder acquaintance Howard (Walter Huston). Painted as down-on-their-luck Americans willing to put in several honest days worth of work for the right price as a welcome vacation from begging any countrymen they encounter in the film's Mexican surroundings, writer/director John Huston takes great pains in establishing his characters during an extended opening sequence that no doubt would be drastically chopped in twenty-first century editing rooms in order to get to the action. In fact, Huston's commendable willingness to set up not only Dobbs' personality but his drive to make a buck makes the eventual ethical and psychological deterioration of Bogart's character that much richer. For as the movie continues, we're left recalling the way that well before he went looking for gold, Dobbs and Curtin took no more than the money they were owed from a trickster they were forced to rough up. This revealing behavior and sense of conflicting values of morality (e.g. violence but only as a means for justice) serves as the character arc upon which Huston will continually build. 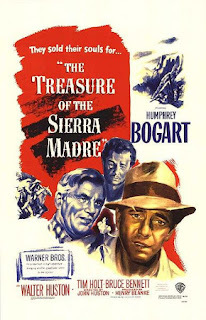 Following The Treasure of the Sierra Madre's lengthy opener, Dobbs and Curtin set out on an adventure, throwing caution to the wind in the form of the very real threat of Mexican bandits roving the hillsides in the 1920s and Howard's warnings that gold can change a sane man into a mad one. And even though by this point, Humphrey Bogart had made playing a certain breed of antihero into an archetypal art form, he took quite a risk in breaking out of the "movie star as saint syndrome" that most A-listers fall into by evolving into one greedy amateur prospector. It's this natural progression, incorporating levels of not-quite-saint to not-quite-sinner which becomes all the more interesting because unlike Michael Douglas' Gordon Gekko in Wall Street , Bogart's Dobbs knew greed was the opposite of good but felt he could rise above temptation, making his downfall the combination of hubris and good intentions. When coupling this with the fact that unlike others tackling the same themes, Huston refused to preach or pontificate as a pastor or a philosopher, instead preferring to present the entire tale simply and without judgment, it becomes much easier to understand why Sierra still fascinates and resonates with us today. As one of the first hundred American pictures selected for the Library of Congress National Film Registry just a year after Huston's directorial debut which marked his first collaboration with Bogart, Maltese Falcon was also chosen, it's only fitting that both titles receive the Blu-ray restoration treatment from parent studio Warner Brothers with Madre's jaw-droppingly clear 1080 pixel transfer. A phenomenal heartbreaker, Madre works well on a number of levels from simple morality play to tragedy or psychological drama. And the film which was the strongest cinematic inspiration for Paul Thomas Anderson's twenty-first century greed fueled masterpiece There Will Be Blood , made further history after its release as the first work to award Oscars to both John Huston (for writing and directing) as well as his father Walter's memorable supporting performance. Loading up the film's high definition debut with a radio show and other documentary features to treasure including an in-depth look at John Huston to coincide with WB's DVD megaset devoted to Bogart, this unforgettable portrait of vibrant gold colored greed is an ideal match for Blu since the hues together remind you of the dangers of green.